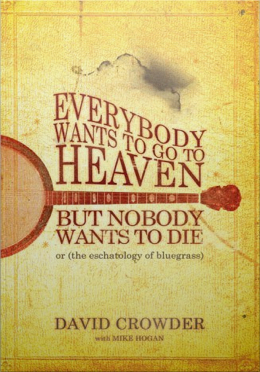 Mike Hogan and David Crowder’s book Everybody wants to go to Heaven but nobody wants to die was a lovely surprise. I found it randomly one day on sale (so bought it)- didn’t even know the man had written a book or two despite loving his music for quite a while. It is a really interesting and honest look at death and grieving and place of the soul in current culture. Although personally having minimal actual musical interest, the speckled lot of bluegrass history added value to the theme and as history tends to be, was actually quite interesting. I loved the book for it’s Pratchett style footnotes and humor – it’s candidity, and the beautiful sections of prose interspersed through the bulk of the text. It was a relatively easy read once I got used the unusual format and the small sections made it great for that ‘last few minutes before bed’ thing. The combo of personal story, theory, history, prose, IM thoughts and general wikipedia fun was really good mix for me personally, and I would go back and tackle it again sometime to probably get a lot more from it. Besides all of the thumbs ups for what’s inside, if you don’t care and just want to judge it by it’s cover, by all means, go ahead. I reckon the cover is pretty fun itself. Sounds like a book I’d love to read. Sounds slightly morbid…not many people want to read about death! However working in a nursing home the issue of death and dying fascinates me. Where did you find it?